Madden NFL 10 is an American football video game based on the National Football League that was published by EA Sports and developed by EA Tiburon. It is the 21st annual installment in the Madden NFL video game franchise. It was released in 2009 for the PlayStation 2, PlayStation 3, PlayStation Portable, Wii, Xbox 360 and BlackBerry, and for the iOS on September 9 through the App Store. All of the features apply to the PS3 and Xbox 360 versions of the game, unless otherwise noted below. PRO-TAK – New animation technology that allows up to nine players to be involved in tackles, ability to steer tackles, a more realistic pocket around the QB caused by a new blocking system, and QB avoidance actions. Fight for the Fumble (Xbox 360, PS3, PS2, PSP) – A fumble pile-up that triggers when a fumble occurs near two players. To gain possession, the user must press a series of buttons that appear on the screen. New Ratings Philosophy – Ratings have been re-scaled for a more noticeable difference between players, and new ratings such as Throw accuracy deep, medium, short, and throw on run and many more, make players styles more realistic. Sim Style Gameplay – Game speed has been reduced for a more realistic, life like experience. Player Momentum – More realistic acceleration, deceleration, planting & turn rates. Quarterback Improvements – Layered blending, new QB ratings and more realistic QB dropback animations. WR/DB Interaction – Improved route running and coverage. Play Designer (PSP) – Players can create custom plays and formations, then upload them directly to a PlayStation 3. Procedural Awareness – System which allows each player to realistically follow the ball using head, eyes, neck and shoulders. Depth of Field – All new system which will not only improve the visual quality of the game but will allow a more realistic broadcast experience. New Injury System – Injury status/severity is delayed instead of immediate for more suspense and realism, all new animations with trainers and injury carts are shown, players playing injured have their ratings affected negatively and are at chance of re-injuring themselves. The Extra Point – A weekly wrap-up show with Fran Charles and Alex Flanagan in franchise mode. Halftime/Postgame Show – Recaps stats and highlights with Alex Flanagan. Super Bowl Presentation – United States Air Force Thunderbirds and National Anthem, along with Super Bowl patches for jerseys and team specific endzones, sidelines and midfield logos. Cutscenes – Multiple pre/post play cutscenes along with camera angles such as coaches on the sidelines and quarterbacks talking on the phone. New announcers (PSP, PS2, Wii) – The PSP, PS2, and Wii versions of the game received new announcers in Tom Hammond and Cris Collinsworth. They replaced Al Michaels and John Madden. Chain gang – The chain gang comes out on a close call for a first down. If it's not a successful first down, the referee will signal how much is left. If it's successful, the referee will point to the team's endzone, just like in real life. Superstar Mode – Made more simple. Aspects such as messages and interviews were removed. Improved Franchise Mode – Improved progression and regression, offseason signing logic, draft logic (players will be picked on needs of the team) and pre-created draft classes and more. Includes the new "Extra Point". New Creation Features – New accessories such as QB towels, additional facemasks, handwarmers, new gloves, arm bands and more. Addition of the Wildcat offense (Xbox 360, PS3,PSP, PS2, Wii) – Players can now run the wildcat offense. Signature QB throwing-style animations – Signature throwing styles for quarterbacks, only quarterbacks who are the default starting or top drafted quarterbacks in the game. Signature Kicking Styles – Different kicking styles. Uniforms – Ability to mix-n-match uniforms with a 3D preview of the uniform while editing. Allowing players to customize team jerseys. Accelerated Clock – Automatic runoff of time from the clock after the huddle. Returned from the Windows version of Madden 2008. Similar to Chew Clock in NCAA Football 10. Cheat codes (Wii) – For the first time since Madden NFL 07, a cheat code system is in place to unlock content such as franchise mode and the Super Bowl XLIV stadium. For the first time in the Madden NFL series, the cover features two players: Troy Polamalu of the Pittsburgh Steelers and Larry Fitzgerald of the Arizona Cardinals. Both players participated in Super Bowl XLIII. On the Wii version of the game, several Cardinals players can be noticed in the background. In the NFL Kickoff game against the Tennessee Titans, Polamalu sprained his MCL while blocking a field goal attempt, causing him to miss a majority of the season. Polamalu's injury has been linked to the continuation of the popular Madden Curse that plagues players immediately after gracing the cover of Madden. Roster updates were released almost every week during the 2009 football season and are required to play online. They are basically changes to team depth charts and player statistical updates. Players on Injured Reserve still can be used in ranked games. Michael Vick and Brett Favre were originally not placed in the rosters for the Philadelphia Eagles and Minnesota Vikings, due to various reasons. In order to receive the characters, the user must have an internet connection and update their rosters online with their specific console, either Xbox Live or PlayStation Online Network. For Xbox users, it is not needed to have a paid online Gold account, one can still get the roster updates with the free online Silver account. In light of the 50th Anniversary celebration of the American Football League this year, on September 24 the AFL Legacy Pack became available as downloadable content on the Xbox Live Marketplace and the PlayStation Network. The pack includes throwback uniforms for the Buffalo Bills, New England Patriots (Boston Patriots), Tennessee Titans (Houston Oilers), San Diego Chargers, Oakland Raiders, Kansas City Chiefs (Dallas Texans), Denver Broncos, and New York Jets (Titans of New York), In addition, games can be played in a classic AFL film grain broadcast camera, referee uniforms are AFL-style orange throwbacks and the team logos on field are old-school. The AFL Legacy Pack also provides a new set of AFL specific Madden Moments and AFL Legacy Pack specific achievements with a 150-point total gain. This "AFL mode" has been met with much approval. Madden Ultimate Team, also known as "MUT" (pronounced: "mutt") is a game mode released on January 7, 2010. In this mode, users are able to build a team by purchasing player packs. These packs are purchased with coins that are earned by winning a game, scoring a touchdown etc. They can also be purchased with real money through the user's PlayStation Network or Xbox Live accounts. As the user gains more coins, they are able to buy better packs of players, eventually building their "Ultimate Team". This mode has received negative feedback with regards to the 'Player Contracts' that are attached to each 'Player Card'. When purchased 'Player Cards' have a 10 match contract - this decreases by 1 every game (even if due to disconnection). Replenishment of a contract on a 'Player Card' is done by a contract card that is purchased with coins. It is thus extremely difficult to keep a good team 'in contract' without spending real money. It is also possible to be in a position where you have a low amount of coins and not enough players to even play 'Madden Ultimate Team' - unless you wish to spend real money to buy contract cards to replenish your players contracts, or to buy new packs with - to try to fill the empty team positions that are stopping you from playing the mode. EA Sports released Madden NFL Arcade as a downloadable title through the PSN Store and Xbox Live Marketplace networks on November 24 respectively. The game is a five-on-five arcade style football game similar to Midway's NFL Blitz, featuring all 32 NFL teams and stadiums. The game features "Game Changers", which are similar to NFL Street's "Game Breakers". There are 13 Game Changers, with players having the opportunity to gain a Game Breaker prior to every play, and are able to use it at that instant or retain for later use. The Xbox Achievements were announced with a total of 12 achievements and a 200 points total gain. Madden NFL 10 was met with positive to average reception. GameRankings and Metacritic gave it a score of 86.51% and 85 out of 100 for the Xbox 360 version; 85.55% and 85 out of 100 for the PlayStation 3 version; 81.88% for the iOS version; 79.50% and 80 out of 100 for the PSP version; 77.17% and 77 out of 100 for the Wii version; and 71.50% and 68 out of 100 for the PlayStation 2 version. Madden NFL Arcade was met with average to mixed reception upon release. GameRankings and Metacritic gave it a score of 71% and 66 out of 100 for the Xbox 360 version, and 65% and 60 out of 100 for the PlayStation 3 version. ↑ "Madden NFL Arcade Release Information for PlayStation 3". GameFAQs. Retrieved May 30, 2015. ↑ "Madden NFL Arcade Release Information for Xbox 360". GameFAQs. Retrieved May 30, 2015. ↑ Archived November 13, 2010, at the Wayback Machine. ↑ "EA Mobile Kicks off Football Season With Madden NFL 10 on the App Store". EA Mobile. September 9, 2009. Archived from the original on July 10, 2011. Retrieved May 29, 2015. 1 2 Cummings, Ian (May 5, 2009). "Madden NFL 10: A Deeper Look Into PRO-TAK". EA Sports Blog. Archived from the original on May 7, 2009. Retrieved May 29, 2015. ↑ raczilla (February 9, 2009). "Madden NFL 10 Player Ratings – A New Philosophy, a New Era". Inside EA. Archived from the original on February 11, 2009. Retrieved May 29, 2015. ↑ Archived November 12, 2010, at the Wayback Machine. ↑ Cummings, Ian (March 27, 2009). "Madden NFL 10: Improvements to WR/DB interaction : Madden NFL 10 Blog". EA Sports Blog. Archived from the original on May 2, 2009. Retrieved May 29, 2015. ↑ raczilla (February 1, 2009). "Madden NFL 10: First Look". Inside EA. Archived from the original on February 3, 2009. Retrieved May 29, 2015. ↑ Young, Michael (March 30, 2009). "Breaking Down "The Shot"". EA Sports Blog. Archived from the original on November 13, 2010. Retrieved April 14, 2009. ↑ PastaPadre (May 25, 2009). "USAF Thunderbirds in Madden 10". PastaPadre. Retrieved May 29, 2015. ↑ EA Sports (August 13, 2009). "Madden NFL 10 Gamer's Guide". Archived from the original on August 16, 2009. Retrieved May 29, 2015. ↑ Varley, Teresa (September 11, 2009). "Steelers lose Polamalu for several weeks". Steelers.com. Archived from the original on September 14, 2009. Retrieved May 29, 2015. ↑ "Madden NFL 10". Xbox LIVE Marketplace. Archived from the original on September 26, 2009. Retrieved May 29, 2015. ↑ Webb, Dan (September 9, 2009). "EA Sports Announces Madden 10 AFL Legacy Pack". Xbox Achievements. Retrieved May 29, 2015. ↑ "Download Madden Ultimate Team Today for Free!". EA Sports. January 7, 2010. Archived from the original on February 8, 2010. Retrieved May 29, 2015. ↑ Syxxandangel (February 11, 2010). "Official reset my team thread". EA Forums. Archived from the original on September 21, 2010. Retrieved May 29, 2015. ↑ Good, Owen (November 13, 2009). "Madden Arcade To Release Nov. 24 And Nov. 25". Kotaku. ↑ Ekberg, Brian (October 14, 2009). "Madden NFL Arcade Is Coming". GameSpot. Archived from the original on October 15, 2009. Retrieved May 29, 2015. ↑ PastaPadre (November 20, 2009). "Madden Arcade Power-Ups". PastaPadre. ↑ "Madden Arcade Achievements". Xbox Achievements. Retrieved May 29, 2015. 1 2 Sarkar, Samit; Nicholson, Brad (August 17, 2009). "Madden NFL 10 (PS3, X360)". Destructoid. Retrieved May 30, 2015. 1 2 Superb, Egon (August 25, 2009). "Madden NFL 10 (PS3, X360)". Eurogamer. Retrieved May 31, 2015. 1 2 Kato, Matthew (September 2009). "Madden NFL 10 (PS3, X360): Tiburon Puts Forth A Strong Team Effort". Game Informer (197). Retrieved May 29, 2015. ↑ Kato, Matthew (September 2009). "Madden NFL 10 (Wii): Madden Wii Relegated To The Bench". Game Informer (197): 91. Retrieved May 29, 2015. 1 2 Dyer, Mitchell (August 10, 2009). "Madden NFL 10 (PS3, X360)". GamePro. Archived from the original on August 14, 2009. Retrieved May 30, 2015. ↑ Kolkmeyer, Dalton (August 14, 2009). "Madden NFL 10 (Wii)". GamePro. Archived from the original on August 17, 2009. Retrieved May 30, 2015. 1 2 Costantino, Jesse (August 17, 2009). "Madden NFL 10 Review (PS3, X360)". Game Revolution. Retrieved May 31, 2015. ↑ Leonard, Shawn (October 6, 2009). "Madden NFL 10 Review (iPhone)". GameSpot. Archived from the original on October 10, 2009. Retrieved May 29, 2015. ↑ Varanini, Giancarlo (August 17, 2009). "Madden NFL 10 Review (PS3)". GameSpot. Retrieved May 29, 2015. ↑ Varanini, Giancarlo (August 20, 2009). "Madden NFL 10 Review (Wii)". GameSpot. Retrieved May 29, 2015. ↑ Varanini, Giancarlo (August 12, 2009). "Madden NFL 10 Review (X360)". GameSpot. Retrieved May 29, 2015. ↑ Villoria, Gerald (August 12, 2009). "GameSpy: The Consensus: Madden NFL 10 Review (X360)". GameSpy. Retrieved May 30, 2015. ↑ "Madden NFL 10 Review (X360)". GameTrailers. August 11, 2009. Retrieved May 31, 2015. ↑ Lafferty, Michael (August 13, 2009). "Madden NFL 10 - PS3 - Review". GameZone. Archived from the original on August 18, 2009. Retrieved May 31, 2015. ↑ Aceinet (August 13, 2009). "Madden NFL 10 - WII - Review". GameZone. Archived from the original on August 18, 2009. Retrieved May 31, 2015. ↑ Hopper, Steven (August 10, 2009). "Madden NFL 10 Review - Xbox 360". GameZone. Archived from the original on August 12, 2009. Retrieved May 31, 2015. ↑ Buchanan, Levi (September 9, 2009). "Madden NFL 10 iPhone Review". IGN. Retrieved May 30, 2015. ↑ Ahearn, Nate (August 14, 2009). "Madden NFL 10 Review (PS2)". IGN. Retrieved May 30, 2015. 1 2 Ahearn, Nate (August 7, 2009). "Madden NFL 10 Review (PS3, X360)". IGN. Retrieved May 30, 2015. ↑ Ahearn, Nate (August 13, 2009). "Madden NFL 10 Review (PSP)". IGN. Retrieved May 30, 2015. ↑ Bozon, Mark (August 12, 2009). "Madden NFL 10 Wii Review". IGN. Retrieved May 30, 2015. ↑ "Madden NFL 10 Revisited". Nintendo Power. 259: 92. October 2010. ↑ "Madden NFL 10". Nintendo Power. 245: 89. September 2009. ↑ McCaffrey, Ryan (August 10, 2009). "Madden NFL 10". Official Xbox Magazine. Archived from the original on August 14, 2009. Retrieved May 30, 2015. ↑ "Review: Madden NFL 10 (PS3)". PlayStation: The Official Magazine: 70. November 2009. ↑ Garmer, Sean (August 31, 2009). "Madden NFL 10 (Xbox 360) Review". 411Mania. Retrieved May 31, 2015. ↑ Jones, Scott (August 17, 2009). "Madden NFL 10 (X360)". The A.V. Club. Archived from the original on January 11, 2010. Retrieved May 31, 2015. 1 2 "Madden NFL 10 for iOS (iPhone/iPad)". GameRankings. Retrieved May 29, 2015. 1 2 "Madden NFL 10 for PlayStation 2". GameRankings. Retrieved May 29, 2015. 1 2 "Madden NFL 10 for PlayStation 3". GameRankings. Retrieved May 29, 2015. 1 2 "Madden NFL 10 for PSP". GameRankings. Retrieved May 29, 2015. 1 2 "Madden NFL 10 for Wii". GameRankings. Retrieved May 29, 2015. 1 2 "Madden NFL 10 for Xbox 360". GameRankings. Retrieved May 29, 2015. 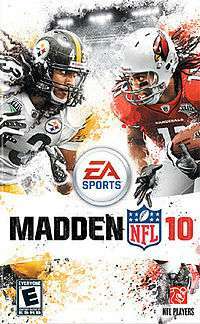 1 2 "Madden NFL 10 for PlayStation 2 Reviews". Metacritic. Retrieved May 29, 2015. 1 2 "Madden NFL 10 for PlayStation 3 Reviews". Metacritic. Retrieved May 29, 2015. 1 2 "Madden NFL 10 for PSP Reviews". Metacritic. Retrieved May 29, 2015. 1 2 "Madden NFL 10 for Wii Reviews". Metacritic. Retrieved May 29, 2015. 1 2 "Madden NFL 10 for Xbox 360 Reviews". Metacritic. Retrieved May 29, 2015. 1 2 Fitch, Andrew (November 30, 2009). "Madden NFL Arcade Review". 1UP.com. Retrieved May 30, 2015. ↑ Sarkar, Samit (December 21, 2009). "Review: Madden NFL Arcade (PS3)". Destructoid. Retrieved May 30, 2015. 1 2 Todd, Brett (December 4, 2009). "Madden NFL Arcade Review". GameSpot. Retrieved May 30, 2015. 1 2 Grisham, Richard (December 18, 2009). "Madden NFL Arcade review". GamesRadar. Retrieved May 30, 2015. 1 2 Haynes, Jeff (November 30, 2009). "Madden NFL Arcade Review". IGN. Retrieved May 30, 2015. ↑ "Madden NFL Arcade". PlayStation Official Magazine: 114. February 2010. ↑ "Madden NFL Arcade". Official Xbox Magazine: 69. January 2010. ↑ "Review: Madden NFL Arcade". Play UK (188): 87. February 2010. ↑ "Review: Madden NFL Arcade". PSM3: 88. March 2010. ↑ Price, Tom (November 25, 2009). "Madden NFL Arcade Review (Xbox 360)". TeamXbox. Archived from the original on February 11, 2012. Retrieved May 30, 2015. 1 2 "Madden NFL Arcade for PlayStation 3". GameRankings. Retrieved May 30, 2015. 1 2 "Madden NFL Arcade for Xbox 360". GameRankings. Retrieved May 30, 2015. 1 2 "Madden NFL Arcade for PlayStation 3 Reviews". Metacritic. Retrieved May 30, 2015. 1 2 "Madden NFL Arcade for Xbox 360 Reviews". Metacritic. Retrieved May 30, 2015.